Now you know the uses of individual domain name. So, our next step is to create a appropriate domain name for our website. 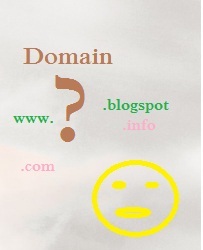 If you have not read about our "what is domain name.......?" article please read it and get a idea before this article. When we selecting a domain name for our site there are several very important things to understand. So, please read the article first and identify the things you have to understand and then make them use. What are the things to remember when creating a domain name......? 1. Appropriate to the niche. Most important thing that you have to do before starting a blog is identification of your talents and necessities. Unless you may waste your valuable time with the money. Just imaging if you want to start writing about Auto-mobiles you have to get it in to your mind and start writing it you does not need to consider about mobile phones. After your identification of your niche, then you have to get a relevant domain name to it. As a example if your have a site on Auto-mobiles your URL should relevant to that niche. This kind of URL helps a lot to get readers towards you. 2. Appropriate to the title. When talking about search engine friendliness, it is necessary to talk about the above to features mainly. relevant keywords in the title may give you additional marks on the search results. Also if you have top level domain your rank on search engine is higher than a sub-domain. Always it is necessary to be easy to remember unless readers can not return to your site.To that you should have short, relevant, domain name. To that you have to get a top level domain. Unless your URL may be like following. 5. Consist of top level domain. As I mentioned above top level domains are very friendly to search engines. As a result you will be having a good position on search results. 6. Consist of appropriate top level domain. Appropriate top level domain means that you should have relevant type of domain from .com, .info, .net, .org, .us, .lk or what ever the relevant domain type. I have write a article on domain. Please visit it to get more details of uses of that. 7.Consist of good web hosting service. Unless you have a good web hosting service, you have face lot of difficulties. To minimize that get a good hosting service. Here you can get Godaddy a domain just for $5.99 and Hosting plan for $1.99/3months. If you have any quarries regarding how to select your domain contact me..